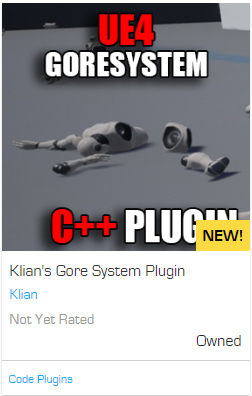 My Gore System Plugin has been approved and pubblished! Now you can buy it on the Unreal Engine Marketplace and get support here on ModDB. I would really like continue developing this plugin so let me know what you think, give me advices or just report bugs you'll found. If you are trying achieve some specific mechanism but you are stuck with my plugin reach me here on moddb or contact me via email, I'll be glad to help you if i can. IMPORTANT: Do not ask for support in the comment section of the marketplace page, there is no notification and i rarely check those pages. This is an UE4 Tech demo for my Gore System Plugin. UE4 Project FPS Template Engine Version: 4.21.2 You'll need the plugin!